Even though 2015 is still fresh and new, Ethan Young has big plans for August. He's got plans to bring bravery in the face of an overwhelming enemy to the forefront of one of the biggest mass murders of World War II. Exploring the horrors of the Nanjing Massacre of 1937, Nanjing: The Burning City focuses on two abandoned Chinese soldiers trapped in the city as they desperately attempt to escape. Outnumbered by the invading Imperial Japanese Army, they’ll encounter the horrors and terrifying effects of war—but they’ll soon learn that no enemy can destroy the spirit of resistance and bravery. Written and drawn by Young, Nanjing: The Burning City delves into one of the most contentious events of World War II. Impeccably researched and drawn in Young’s critically acclaimed style, the original graphic novel brings new insight into one of World War II’s forgotten tragedies. Nanjing: The Burning City hits stores August 2015 for $24.99. Full press release below. FOR IMMEDIATE RELEASE: MILWAUKIE, OR—In August, award-winning graphic novelist Ethan Young (Tails) brings bravery in the face of an overwhelming enemy to the forefront of one of the biggest mass murders of World War II. Exploring the horrors of the Nanjing Massacre of 1937, Nanjing: The Burning City focuses on two abandoned Chinese soldiers trapped in the city as they desperately attempt to escape. Outnumbered by the invading Imperial Japanese Army, they’ll encounter the horrors and terrifying effects of war—but they’ll soon learn that no enemy can destroy the spirit of resistance and bravery. Written and drawn by Independent Publisher Book Award winner Ethan Young, Nanjing: The Burning City delves into one of the most contentious events of World War II. Impeccably researched and drawn in Young’s critically acclaimed style, the original graphic novel brings new insight into one of World War II’s forgotten tragedies. 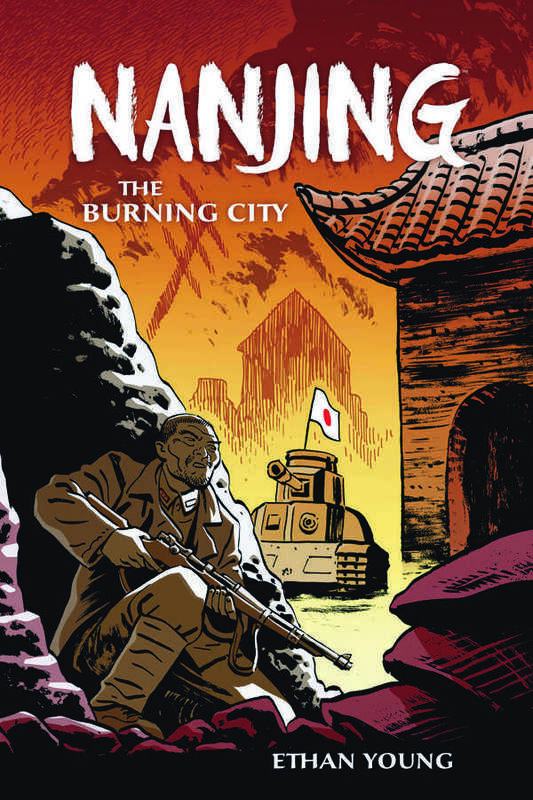 Nanjing: The Burning City hits stores August 2015 for $24.99.